Around 30 minutes have been chopped from the running time of the EE and some elements have been moved around, changing the narrative structure. This fanedit is conservative in the cutting. I didn't cut any entire scenes that weren't Azog related, but almost every part of the movie has been altered except for “riddles in the dark”. I tried to use as much footage as possible as long as it fit my goals. This version of the film doesn't bash you over the head with too much information related to the Lord of the Rings, and tells the story in a more timely fashion. Big changes to the tone of this edit comes by the deletion of all the mushy speeches, except for Bilbos at the very end. I think these speeches violate a basic rule of good story telling: Show, don't tell. These speeches are gimmicks to get the audience to feel a certain way, but really they just slow down story telling. If the story is told right the audience will be able to feel the intention of the film maker instead of being told what to feel. Also, the role of Azog has been reduced, and improved, to maximize his presence in the movie, and turn him into a meaningful enemy. This cut is honest to both the source, and to Jackson's vision. It uses the strengths of Jacksons vision, while taking out the worst parts. The way I edited the beginning of the film is radically different and I think improves the first half of the movie considerably. -Prologue-moved/recut- the prologue is pretty much gone, we jump right into the plot of the movie. Information is given to the audience through the film, no need to spell it out right away. -Bits of Bilbos dialogue removed for pacing. -All flashbacks to Erebor moved to other areas of the film. -Dwarves dinner cut sparingly, makes the dwarves less outright insulting. -Insertion of Erebor flashbacks during Dwarve planning. I love the way this turned out. flashbacks cut for pacing/context. -Moria scene cut to eliminate azogs "oath". -All other major scenes with Azog cut from film. 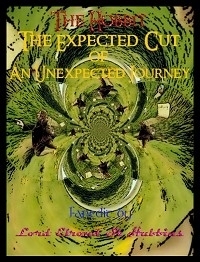 -Radagast introduction cut 90%, some of it moved to his second appearance. -Gandalf/Thorin arguments about elves edited to make less of a big deal out of it. -Extended action cut from troll scene. -Radagast pipeweed lines eliminated. I kept the stick insect one. -Chase of the wargs mostly cut from the film. -Circling of elves on horse around dwarves shortened. -White council scene cut to remove foreshadowing to LOTR. -Galadriel psychic communication edited out. -Gandalf/Galadriel one on one scene cut .cheesy and ruins the flow. -Stone giants are still in the film, but the ridiculous aspects of the scene removed. -Bofur-Bilbo conversation about homelands removed. -Fall into goblin town shortened. -Entrance of the ring, falling from Gollum, removed. -Ridiculous physics elements edited from goblin town escape. -Bilbo speech removed before out of frying pan. -Out of frying pan edited to remove some Azog shots and make it about the wolves. I watched this recently and liked it. Having recently completed one of these Hobbit edits myself, I wanted to see what the preceding edits were like, and I must say that Lord Elrond's edit was pretty darn close to what I would have done myself. The Hobbit trilogy seems to be films asking to be fan edited. Initially planned as two movies, the first half was almost ready to go when Peter Jackson decided to split two into three. So, for the first one, we have a film that was originally edited as even longer (using some parts of the next film). Plus, on home video we were given an extended edition. Also, did I mention that The Hobbit trilogy is based on a single book? Basically, what I'm trying to say is that there are a lot of different ways this narrative can be messed with and changed. 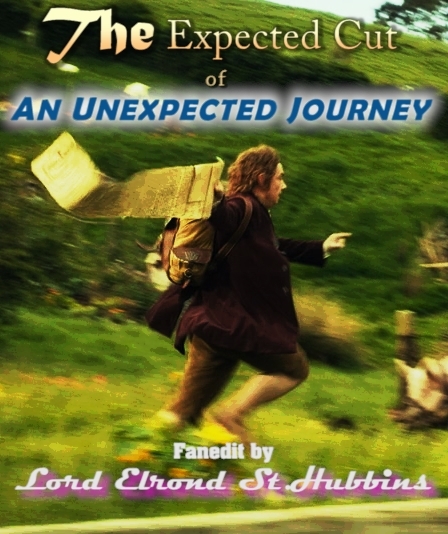 I believe (at the time of writing this review) that there are now three Hobbit edits on IFDB. They all have their similarities and differences. Soon there will be even more. Much like the edits for the Star Wars prequels, they're all good - you have to decide (as a viewer) what elements of the story you want to see. 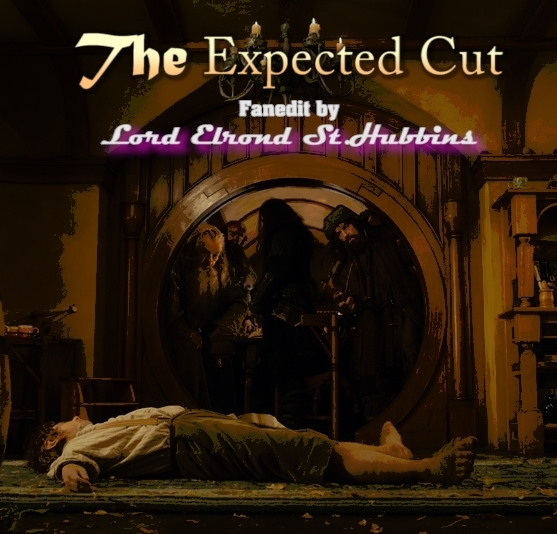 So while the Expected Cut is not the version of The Hobbit: An Unexpected Journey that'd I'd like to see (I'll stick with either Kerr's Arkenstone Edition or the official Extended Edition, based on my mood), I'm happy to say that, if you look at this edit's cut list and you like what you see, this edit will certainly satisfy you. It's technically proficient and has no narrative issues. If this is the type of Hobbit you want to see, then go for it. My one qualifying statement is that there is a scene in this edit that I'm not sure will work for everyone. During the dinner scene, the editor cuts back to Bilbo's narration (the prologue is interspersed into the dinner conversation, essentially). For me, this doesn't work. This is the only part in the film where Bilbo's narration comes back, and it just seems random. I know what the editor was going for here, but I just don't think it can be satisfyingly accomplished with the material. Anyway, all in all, a great edit. Is it perfect? No. Will you enjoy it? Yes. Go watch it if you so desire. I watched the 720p mp4 version last night and I enjoyed it. This review does not aim to compare the edit to the original or to other edits, rather it is an evaluation of the edit as a separate entity, that is to say, If I went to see it in theater or had a DVD, would I like it or not, and what comments would I have. 1- The quality of the video and audio was very good, the audio level is uniform across the whole movie. 2- The story flow was good and continuous, without too much jumping around. 3- The edits, cuts and seen changes were generally smooth and well done. 1- The audio is 2 ch, I think a movie like that deserves a 5.1 surround sound. 2- The addition of a commentary audio track would be a plus, but its absence does not detract from the quality of the movie. 3- The biggest negative for me was the cut at 00:19:20. This is a cut in the middle of the narrative about Dale, Erebor and the dragon Smaug. Right in the middle of the narrative, the seen is abruptly cut and changes back to Bilbo's home, then after 40 seconds at 00:20:00 the narrative is again resumed. This cut was very abrupt and disruptive to the narrative, and it feels like someone has dropped in those 40 seconds for no good reason except to let Bilbo say "I know what a dragon is" . Apart from this last negative, I did enjoy the movie and I would recommend it to others.